A key area of public policy in the last twenty years is the question of how, and how much, to protect vthe environment. At the heart of this has been the heated debate over the nature of the relationship between economic growth and environmental sustainability. Is environemental sustainability economic growth or `green growth', a contradiction in terms? Avoiding the confusion that often surrounds these issues, Ekins provides rigorous expositions of the concept of sustainability, integrated environmental and economic accounting, the Environmental Kuznets Curve, the economics of climate change and environmental taxation. Individual chapters are organised as self-contained, state-of-the-art expositions of the core issues of environmental economics, with extensive cross-referencing from one chapter to another, in order to guide the student or policy-maker through these complex problems. 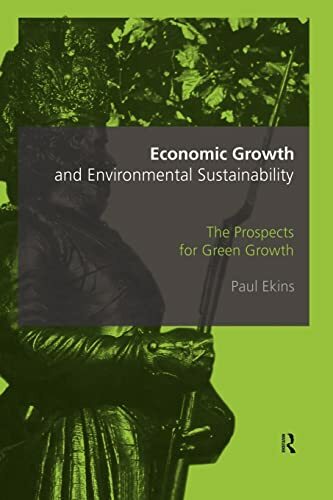 Paul Ekins breaks new ground in defining the conditions of compatibility between economic growth and environmental sustainability, and provides measures and criteria by which the environmental sustainability of economic growth, as it occurs in the real world, may be judged. It is argued that `green growth' is not only theoretically possible but economically achievable and the authors show what environmental and economic policies are required to achieve this. Economic Growth and Environmental Sustainability will be welcolmed by students of and researchers in environmental economics and environmental studies, as well as all interested policy-makers.